Eugene is a kids' magician based in Dublin. He turned professional after winning the magicians' cup for best stage act. He subsequently performed at at every conceivable venue from birthdays to embassies to festivals and corporate events. Eugene really is as the Irish Times said "one of the best out there." So whether it's a birthday party at home or a larger event you are guaranteed a brilliantly entertaining show. The show is filled to the brim with comedy, visual gags, one liners, banter, funny props and situation comedy - but the kids will want to see some real magic. When Eugene makes a dove appear in his first trick you can see the astonishment from kids and adults alike. It's the kind of thing kids have only seen on TV. SOMETIMES IT"S GOOD TO JUST GO "WOW". The kids will go "WOW" and "WOW" again when they see a newspaper being torn and restored or the impossible appearance of a jumbo 8ft straw or a cake being made in a hat or a full bottle of coke being squished. Young kids will love the tricks with cartoon animals. Even adults will sing along with the dramatic vase on head trick. There's lots more brilliant tricks besides and the biggest "WOW" of all is when a child turns the doves into a REAL RABBIT. "A fantastic show which keeps children at the edge of their seats with anticipation of what's to come next. Real magic and mystique "
Tony Hegarty, school principal and organiser of St. Brigid's Summer camp, Castleknock. ""Really had the audience gasping"." ""As always . . . wonderful, wonderful, wonderful. The kids had a ball and so do I every time". " ""I wanted to tell you that everyone (children and adults) were delighted by your entertainment and had great fun"." ""Thank you so much for today. The children absolutely loved it . . . and the adults too!! The comments from the children to their parents on collection were great, all about real magic. Suzanne is convinced that she magic'd the rabbit with her wave of the wand!! Thank you for a wonderful show and endless stories for the children to tell at school next week"." ""Hi Eugene, thanks so much for your fantastic show today. It was wonderful and everyone enjoyed it"." ""Hello Eugene, thanks again for putting on a great show. 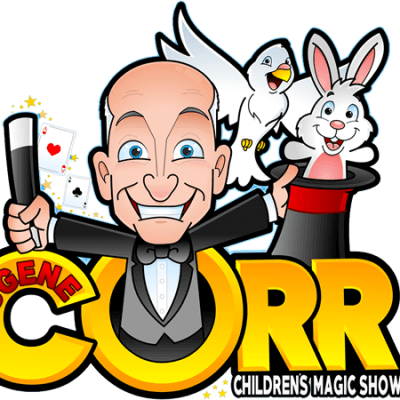 Please feel free to publish the following testimonial on your website: 'Eugene put on a magic show for our son's 4th birthday and his greatest trick of all was to hold the full attention of twelve 4 year old children. He had a great rapport with his young audience and involved each of them with his tricks over the course of the hour. He finished his performance by creating balloon animals and swords for each of the children which worked really well. I strongly recommend him." ""My son attended a party last month in Sandycove for his friend Paddy where you performed - needless to say he was mesmerised"." ""Thanks for a brilliant show yesterday, the kids AND adults loved every minute of it. You did a great job, don't know where you get your energy!! Thanks again"." ""Thanks a million - see you next year"."